THE usual sources of raw material for alcohol production from starch are cereal grains such as corn, wheat, rye, barley, milo (sorghum grains), rice, etc. Other types of starch are available from potatoes of all kinds, Jerusalem artichokes, and other high-starch vegetables. Starch conversion is the standard method of production and the one we will discuss here. It is possible, however, to make alcohol from sugar-producing plants (saccharine material) such as sugar beets, sugarcane, fruits, and others. These substances need no milling (as do grains), but they do require some kind of grinding or squeezing process. Rapid, efficient fermentation of these sugars has not been as well explored as the process using starch. A third source of fermentables is cellulose, as found in wood and waste sulphite liquor. This more complex process requires the use of acids to reduce the material to wood sugars. Consequently, most do-it-yourselfers should stick to either starch or sugar. All grains must be ground before mashing to expose the starch granules and help them remain in suspension in a water solution. The grain should be ground into a meal -- not a flour! -- that will pass a 20-mesh screen. On a hammermill, however, a 3/16" screen will suffice. Potatoes and similar high-moisture starch crops should be sliced or finely chopped. Since potato starch granules are large and easily ruptured, it isn't necessary to maintain the hard rapid boil which is required of the tougher, dryer "flinty" starches found in grains. Next, add 3 measuring spoons -- as provided -- per bushel of MOTHER's Alcohol Fuel Mash Cooking Enzyme (mixed in water) to the mixture and raise the temperature of the mash to 170 deg F (77 deg C), the optimum working environment for the enzyme. Hold the solution at that temperature for 15 minutes while agitating it vigorously. At this point all the starch available at 170 deg F has been converted to dextrins, so it's time to raise the temperature of the mash to the boiling point. The concoction should be liquid enough to roll at its own rate -- if not, add 2 to 3 gallons of water. Hold the boil for 30 minutes to complete the liquefaction stage. All the starches are now in solution. Now reduce the temperature to 170 deg F, using the cooling coil, and add 3 more measuring spoons per bushel of MOTHER's Cooking Enzyme (mixed in water). After 30 minutes of agitation at this temperature, all the previously released starches will have been reduced to dextrins, thereby completing primary conversion. During secondary conversion the dextrins are further reduced to simple sugars (maltose and glucose) by the beta, or -- to be more exact -- glucoamylase enzymes. Because MOTHER's Alcohol Fuel Fermentation Powder contains both the enzymes and the yeast necessary to carry out secondary conversion and proper fermentation simultaneously, you can add 6 measuring spoons per bushel of the fermentation powder (mixed in water) as soon as you've brought the temperature down to 85 deg F (29 deg C) using the cooling coils. Instead of using commercial enzymes, it is possible to affect conversion by employing barley malt -- at the ratio of 15% by weight, or 7 pounds per bushel -- in both the pre- and post-boil. However, such a technique requires a more acidic medium (about pH 4-5) and lower temperatures -- about 145 deg F (63 deg C) is optimum -- than MOTHER's powders. Though the weights and temperatures differ, the same sequence is followed as discussed in "Conversion With MOTHER's Enzymes". If you use barley malt for the conversion process -- or if you are following some alternative recipe that does not employ MOTHER's Fermentation Powder -- you will need to add your own yeast. Mix up two ounces of distiller's or baker's yeast in a quart or two of the liquid mash, and add the concoction to the wort. Vigorous agitation will oxygenate the mixture and encourage a rapid initial growth of the yeast culture. Yeast plants can propagate in a solution with or without air, so agitate only enough to saturate the wort with air and then let it stand still. If the mash is continually agitated, the yeast will reproduce faster and make less waste: carbon dioxide and alcohol. But if the solution becomes anaerobic (without air) the yeast slows down reproduction and makes more alcohol and carbon dioxide. Yeast also produces enzymes of its own to convert complex sugars. Since sugar conversion and alcohol conversion can take place simultaneously, the amylase enzymes and the yeast work in cooperation to convert the dextrins to glucose and fructose and then to alcohol and C02. Fermentation is a chemical process and produces heat. In concentrated or particularly large mashes, the temperature can actually rise to levels dangerous to yeast. Since the ideal temperature for yeast is around 85 deg F, it's best to maintain that temperature by either utilizing cooling coils or keeping the water-to-grain ratio at about 40 gallons per bushel. Conversion of sugars to alcohol and C02 will be completed in three to five days, depending on the temperature of the mixture and the type of yeast used. You can tell when the mash is done by watching the "cap" of solids on top of the solution. During fermentation, the rising C02 keeps the solids in constant motion, but when the bubbling stops, the solids fall to the bottom. At this time, you're ready to separate the solids from the liquids and begin distillation. Remember, sanitation is extremely important! There are many kinds of invading bacteria, including strains which can withstand boiling temperatures. So, observe the same standards that any restaurant or kitchen follows. And keep the fermenting vat well covered: a fly in the ointment will turn your mash into something that it's best to keep upwind of. High-temperature versus low-temperature cooking. Grain must be cooked to rupture the starch granules and to make the starch accessible to the hydrolysis agent. Cooking time and temperature are related in an inverse ratio: high temperatures shorten cooking time. Industry practice is to heat the meal-water mixture by injecting steam directly rather than by heat transfer through the wall of the vessel. The latter procedure runs the risk of causing the meal to stick to the wall; the subsequent scorching or burning would necessitate a shutdown to clean the surface. High-temperature cooking implies a high-pressure boiler. Because regulations may require an operator in constant attendance for a high-pressure boiler operation, the actual production gain attributable to the high temperature must be weighed against the cost of the operator. If there are other supporting rationale for having the operator, the entire cost does not have to be offset by the production gain. Continuous versus batch processes. Cooking can be accomplished with continuous or batch processes. Batch cooking can be done in the fermenter itself or in a separate vessel. When cooking is done in the fermenter, less pumping is needed and the fermenter is automatically sterilized before fermenting each batch. There is one less vessel, but the fermenters are slightly larger than those used when cooking is done in a separate vessel. It is necessary to have cooling coils and an agitator in each fermenter. If cooking is done in a separate vessel, there are advantages to selecting a continuous cooker. The continuous cooker is smaller than the fermenter, and continuous cooking and hydrolysis lend themselves very well to automatic, unattended operation. Energy consumption is less because it is easier to use counterflow heat exchangers to heat the water for mixing the meal while cooling the cooked meal. The load on the boiler with a continuous cooker is constant. Constant boiler load can be achieved with a batch cooker by having a separate vessel for preheating the water, but this increases the cost when using enzymes. Continuous cooking offers a high-speed, high-yield choice that does not require constant attention. Cooking at atmospheric pressure with a temperature a little over 200 deg F (93 deg C) yields a good conversion ratio of starch to sugar, and no high-pressure piping or pumps are required. Separation versus nonseparation of nonfermentable solids. The hydrolyzed mash contains solids and dissolved proteins as well as sugar. There are some advantages to separating the solids before fermenting the mash, and such a step is necessary for continuous fermentation. Batch fermentation requires separation of the solids if the yeast is to be recycled. If the solids are separated at this point, the beer column will require cleaning much less frequently, thus increasing the feasibility of a packed beer column rather than plates. The sugars that cling to the solids are removed with the solids. If not recovered, the sugar contained on the solids would represent a loss of 20%o of the ethanol. Washing the solids with the mash water is a way of recovering most of the sugar. Continuous fermentation. The advantage of continuous fermentation of clarified beer is the ability to use high concentrations of yeast (this is possible because the yeast does not leave the fermenter). The high concentration of yeast results in rapid fermentation and, correspondingly, a smaller fermenter can be used. However, infection with undesired micro-organisms can be troublesome because large volumes of mash can be ruined before the problem becomes apparent. Specifications of the fermentation tank. The configuration of the fermentation tank has very little influence on system performance. In general, the proportions of the tank should not be extreme. Commonly, tanks are upright cylinders with the height somewhat greater than the diameter. The bottom may be flat (but sloped for drainage) or conical. The construction materials may be carbon steel (commonplace), stainless steel, copper, wood, fiberglass, reinforced plastic, or concrete coated on the inside with sprayed-on vinyl. Usually, the tanks are covered to permit collection of the C02 evolved during fermentation so that the ethanol which evaporates with it can be recovered. Many potential feedstocks are characterized by relatively large amounts of fibrous material. Fermentation of sugar-rich material such as sugar beets, sweet sorghum, Jerusalem artichokes, and sugarcane as chips is not a demonstrated technology and it has many inherent problems. Typically, the weight of the nonfermentable solids is equal to or somewhat greater than the weight of fermentable material. This is in contrast to grain mashes which contain roughly twice as much fermentable material as nonfermentable material in the mash. The volume occupied by the nonfermentable solids reduces the effective capacity of the fermenter. This means that larger fermenters must be constructed to equal the production rates from grain fermenters. Furthermore, the high volume of nonfermentable material limits sugar concentrations and, hence, the beer produced is generally lower in concentration (6% versus 10%) than that obtained from grain mashes. This fact increases the energy spent in distillation. Since the nonfermentable solid chips are of larger size, it is unlikely that the beer containing the solids could be run through the beer column. It may be necessary to separate the solids from the beer after fermentation because of the potential for plugging the still. The separation can be easily accomplished, but a significant proportion of the ethanol (about 20%) would be carried away by the dewatering solids. If recovery is attempted by "washing out," the ethanol will be much more dilute than the beer. Since much less water is added to these feedstocks than to grain (the feedstock contains large amounts of water), only part of the dilute ethanol solution from the washing out can be recycled through the fermenter. The rest would be mixed with the beer, reducing the concentration of ethanol in the beer which, in turn, increases the energy required for distillation. Another approach is to evaporate the ethanol from the residue. By indirectly heating the residue, the resulting ethanol-water vapor mixture can be introduced into the beer column at the appropriate point. This results in a slight increase in energy consumption for distillation. The equipment for separating the fibrous residue from the beer when fermenting sugar crops could be used also to clarify the grain mash prior to fermentation. This would make possible yeast recycling in batch fermentation of grain. The optimum fermentation conditions are a temperature of 86 deg F (30 deg C) and a pH of 4 to 5. When the grains are left in the sweet wort or when backset is utilized, a buffering capacity is added that assists in maintaining the required pH (acidity). The expected alcohol yield from a 15-25% solution of fermentable sugars is 6.75 to 11.25% by weight. The time required to complete the fermentation is dependent upon the strain of yeast used. A variety of yeasts were tested for molasses fermentation in order to find a yeast strain that is highly efficient under variable conditions. (A group of 12 so tested is listed in the table below.) The ATCC 4132 produced 93 to 95% of the theoretical yield of alcohol from molasses without molasses pretreatment. The remainder of the yeasts were less efficient in alcohol production with the 48-hour fermentation efficiency ranging down to 35% (Heinz, September 11, 1979). Source: Heinz, Don J., Technology of Ethanol Production, Experiment Station, Hawaiian Sugar Planters' Association, Media Briefing on Energy, September 11, 1979. For small-scale production, the most readily available yeast is active dry yeast especially designed for distillers' use in grain mash fermentation. This product has been found to work well for beet, cane, and citrus molasses fermentation. The yeast is designed to produce uniform, rapid fermentation and maximum alcohol yields under a wide range of temperatures and pH. The time required for fermentation will vary with the temperature, although most estimates are for 48 to 72 hours. Yields of alcohol may be reduced if there is any contamination of the sweet wort. Contamination with undesirable micro-organisms will decrease the yield of alcohol as these will compete with the yeast for the sugar. Prior to the addition of the yeast, contamination from external sources or from the equipment itself may occur readily in the cooling of the sugar mixture. At this point in the process, the sugar solution is a suitable medium for growing a variety of microbes that may be pathogenic or produce toxic substances (Crombie, 1979). Microbes may be introduced with the raw materials initially, via the addition of cooling water, or from the air; thus, provision needs to be made for high-quality water, and the design must incorporate some protection from possible contamination from the air. Fortunately the contamination problem is mitigated by the fact that yeast populations grow quite rapidly, and overwhelm many of the potentially competing organisms. In addition, the initial inoculation introduces a large yeast population that allows the yeast a head start. Provided care is exercised and, thus, unwanted microbial action does not occur, decreases in the yield of ethanol resulting from competing reactions can be held to a minimum. Undesirable microbial reactions occurring in the fermentation step may produce unwanted substances in the stillage, but since these cannot be predicted in advance and would be batch-specific, they would need to be handled on an individual batch basis. The solution to the contamination problem involves the design of the production facility and the training of the process operator. The plant must be designed in such a fashion that sanitation is readily accomplished and contamination of the sweet wort may be avoided when reasonable care is exercised. Once the operating procedures for a plant are established, these problems should be minimal. All equipment currently being marketed utilizes a batch fermentation process; however, continuous fermentation units have been used in some industrial applications. A continuous fermentation process allows the use of smaller fermenters and supplementary equipment; it has been of interest for many years. Continuous fermentation methods have been used successfully on waste sulfite liquor in Europe. Since sulfite liquors are sterile and even antiseptic, continuous fermentation is possible and desirable. With fermentable substances such as molasses, however, any contamination is cumulative and soon spreads throughout the system to reduce yields. The contamination can be controlled to some extent using penicillin or other antibiotics, but their use to control organisms competing for sugars and decreasing alcohol yields creates another problem: the use of by-product feed. The antibiotic content of feeds for livestock is carefully controlled by the Food and Drug Administration. FDA requires tests to show that antibiotics and their degradation products in the resulting by-product feeds are below the maximum allowable levels. Most of these antibiotics are destroyed in the drying process. One commercial ethanol producer looked at and experimented with a continuous process, but finally gave up because of the contamination problems involved. However, continuous fermentation could conceivably work well if the fermentable solution could be sterilized. But with grains or cellulose feedstocks, the grain particles and fiber present in the sweet wort make such sterilization extremely difficult. If wheat is used as the feedstock, special provisions must be made for the additional foaming that occurs during fermentation because of the presence of the gluten protein. Three possibilities exist to handle this problem: increasing the capacity of the equipment over that for the same quantities of corn; using a defoaming agent; or removing the gluten protein prior to the fermentation process. Since the fermentation process produces heat and the optimum fermentation temperature is about 90 deg F (32 deg C), cooling is necessary in order for the yeast to survive and work efficiently. The formation of ethanol is accompanied by approximately 287 kilocalories per kilogram of ethanol produced: 517 BTU per pound or 3,418 BTU per gallon (Alfa-Laval, undated). If insufficient cooling is provided, the fermentation times are increased. 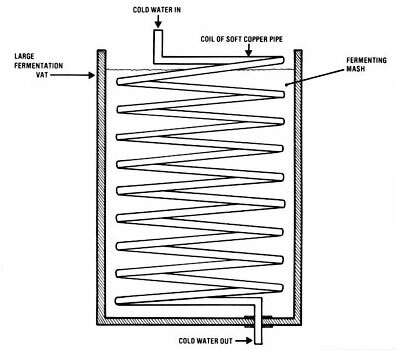 Where no provision is made for removal of the heat of fermentation, heat losses may occur in both of these ways:  from the evolution of carbon dioxide, and  from convection and radiation from the walls and other surfaces of the fermenter vessel. Heat removal in the off-gas is relatively small, even though the gas is saturated with water vapor and its attendant evaporative cooling effect. If heat evolution is too great to be dissipated by radiation, the increasing temperature of the contents results in a decreased yeast activity and a greater heat release. * Probable yield from a short ton of the raw material, calculated from the average fermentable content. ** Jacobs, P. B., and H. P. Newton, U. S. Dept. Agr, Misc. Pub. 327, December, 1938. *** USDA, Ag. Stat., 1978. **** Estimate for three harvests of heads per year.